You've heard me say, I was never a big fan of Bill Gates as a business leader, but now I'm a huge fan of him as a philanthopist. 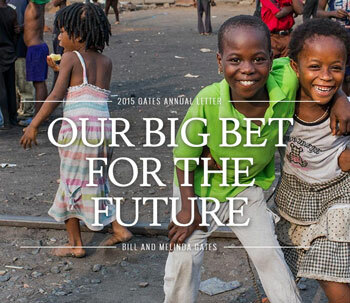 His Bill & Melinda Gates Foundation just released their annual letter, and as always, it's most interesting reading. Their big bet: "the lives of people in poor countries will improve faster in the next 15 years than at any other time in history." We'll see. The biggest problem poor countries face is seemingly fast population growth, but (1) and (2) will definitely help, and seem plausible. I'm interested that (3) made the list; it seems so specific compared to the other items. Not surprised to see (4) and indeed one would expect this. I'm curious whether other issues can be solved, such as political corruption, unproductive infighting between factions, basic property rights, and differential birthrates between different economic groups. We'll see. Regardless, there is little doubt that the Bill & Melinda Gates Foundation has made a huge difference. Onward!